We received rave reviews from our customers regarding Casablanca - we can think of no better recommendation. Long oval tubers with a white flesh ooze great taste and a perfect all-rounder for kitchen use. Could become an exhibitors classic too. Excellent resistance to disease and to eelworm. 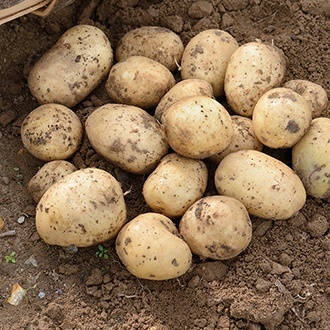 All potatoes (except for maincrops) will benefit from ‘chitting’ prior to planting out. The chitting process encourages the seed to sprout, which then when planted, helps them to establish more readily, leading to bigger crops. Simply place them, blunt end up, in an old egg box until the shoots are approximately 1½ to 2½cm (½ to 1in). Potatoes are delivered in 1.5kg bags, each pack containing approx. 15-20 tubers.